Are you looking for an original dish to serve for Christmas that is tasty, not too difficult, but different from anything you’ve ever had for Christmas before? Then this might just be it! You need to be able to source salsify, duck breast, sumac, and fermented black beans, though. This sounded like something worth trying, and I decided to turn it into a full dish by adding duck breast seasoned with five spice. The resulting dish was wonderful, and something I’ll definitely make again. Besides learning a great new to prepare salsify, I also learned about sumac. I had never used this spice before. 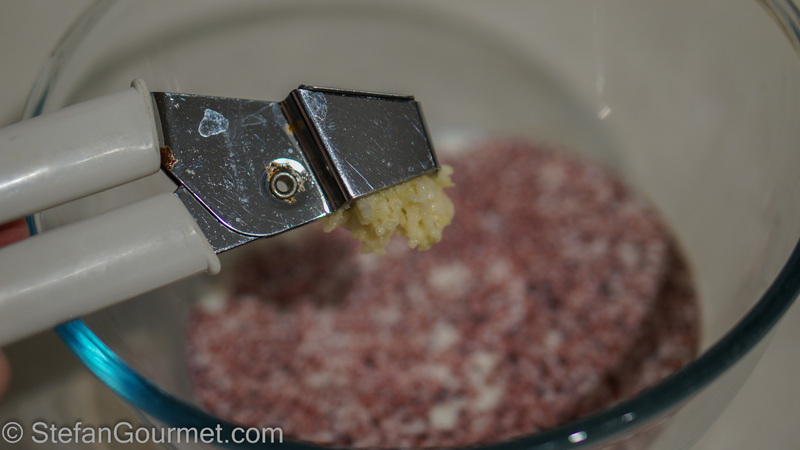 Sumac is a tangy crimson spice, made by grinding the dried fruit of a shrub of the same name. It is available from Mediterranean markets. Thanks, Clayton! Even in Clayton’s preparation the flavor of the salsify itself is not that pronounced either, but with the garlic, ginger, sumac, and fermented black beans it is truly wonderful. And it works very well with the five-spice-duck! 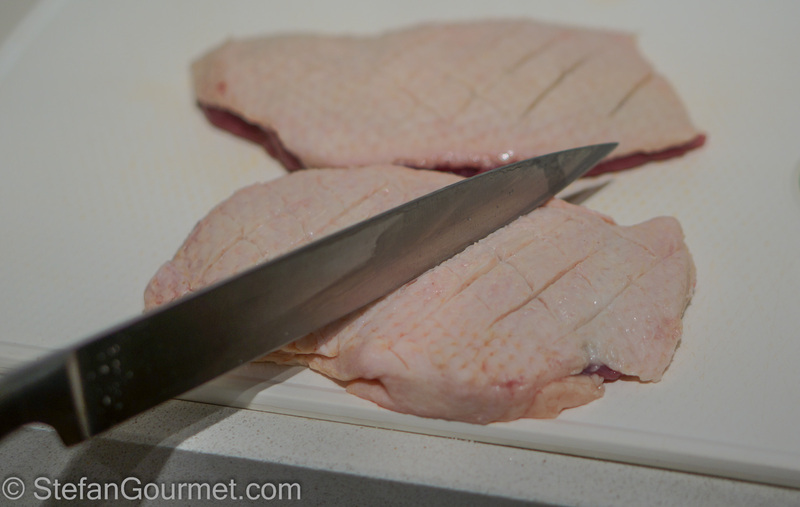 With a sharp knife, score the skin of the duck breast fillets in a diamon pattern. Try to avoid cutting into the meat, just the skin. 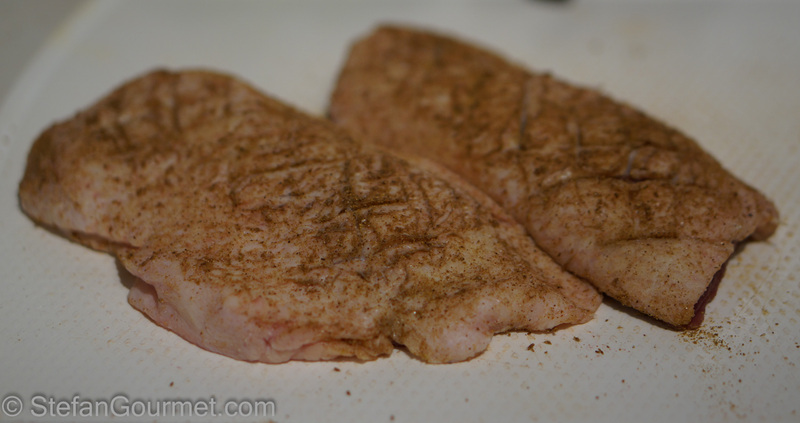 Season the duck breast fillets with salt and the five spice on both sides, rubbing the spices into the meat. 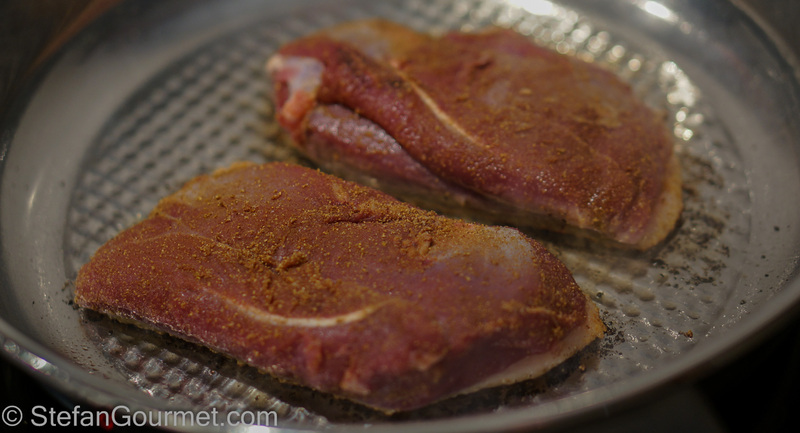 Render some of the fat from the fat side of the duck breast fillets over medium high heat in a dry frying pan, about 4 minutes. Then quickly brown the other side as well. If cooking sous-vide, allow the duck to cool off. If cooking in the oven, finish the duck in a low oven (100ºC/200ºF) to a core temperature of 57ºC/135ºF. Peel the salsify (use gloves to avoid staining your hands), cut them into 10 cm (4 inch) lengths and put them in a bowl of water to which you have added some lemon juice or vinegar to prevent discoloring. 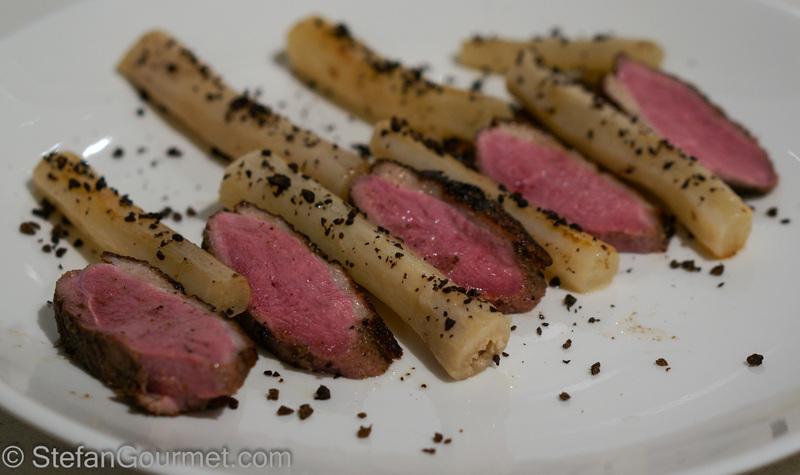 To following is to cook the salsify sous-vide. 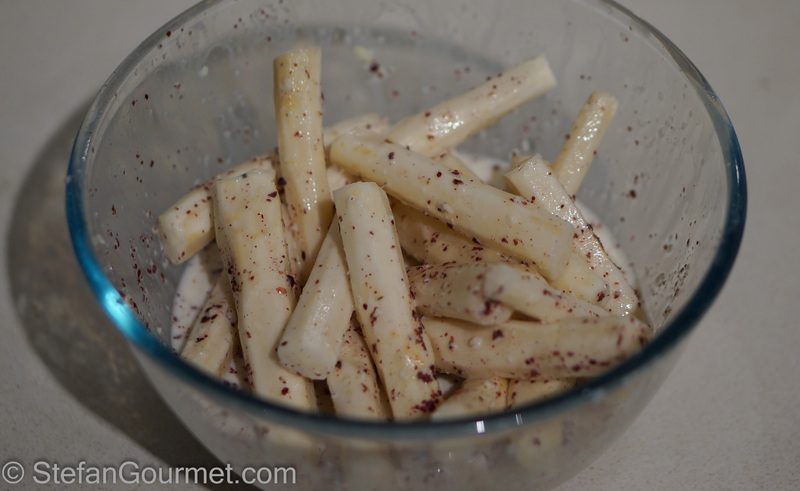 To poach the salsify instead, put the salsify in a pot, cover with milk, add the sumac, garlic, ginger, and salt, bring to a boil, reduce to a simmer, cover, and poach until the salsify are tender. 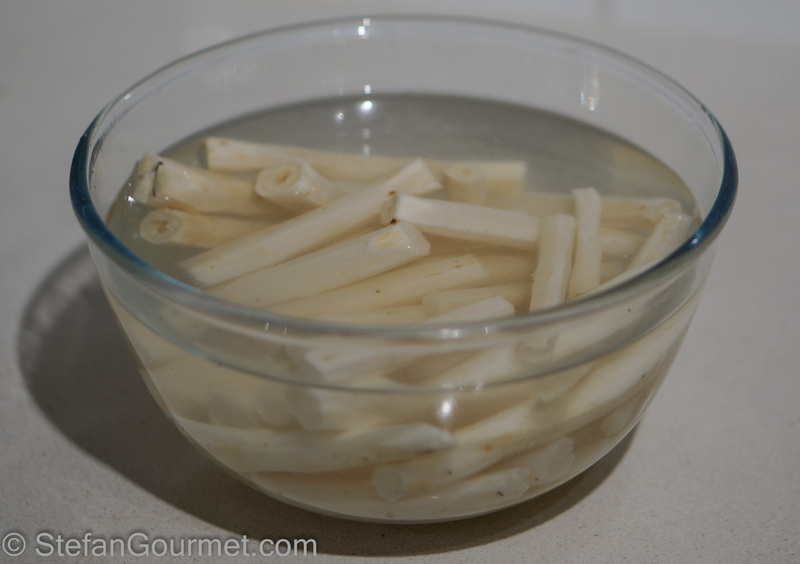 The advantage of cooking the salsify sous-vide is that you will need only 250 ml (1 cup) of milk. 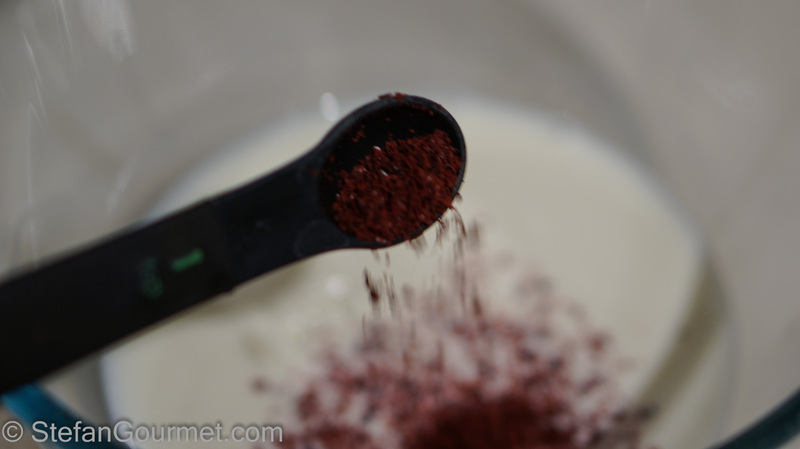 Add the sumac to the milk. 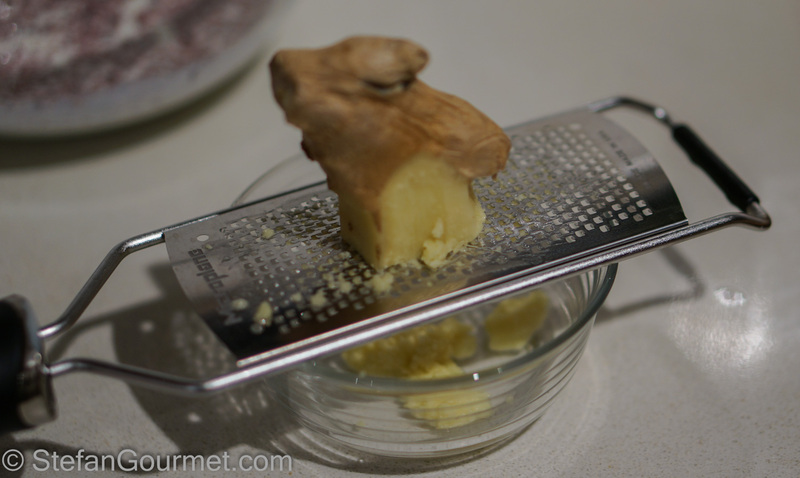 Add the grated ginger as well. 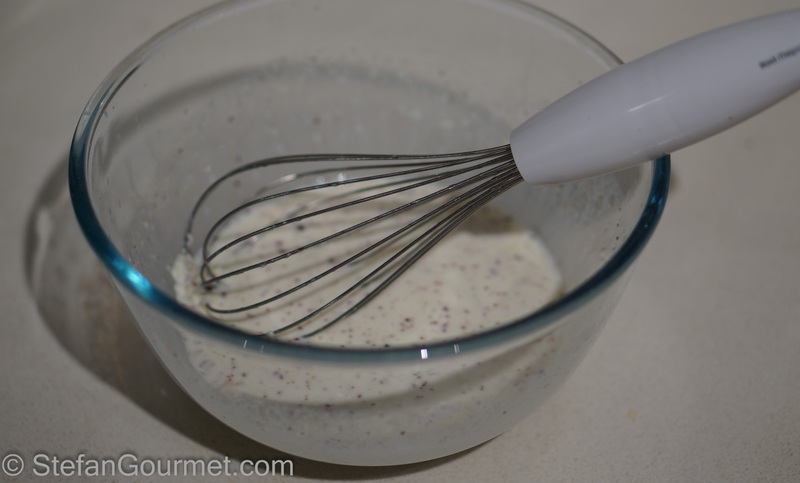 Add a teaspoon of salt and whisk to mix. …and vacuum seal. 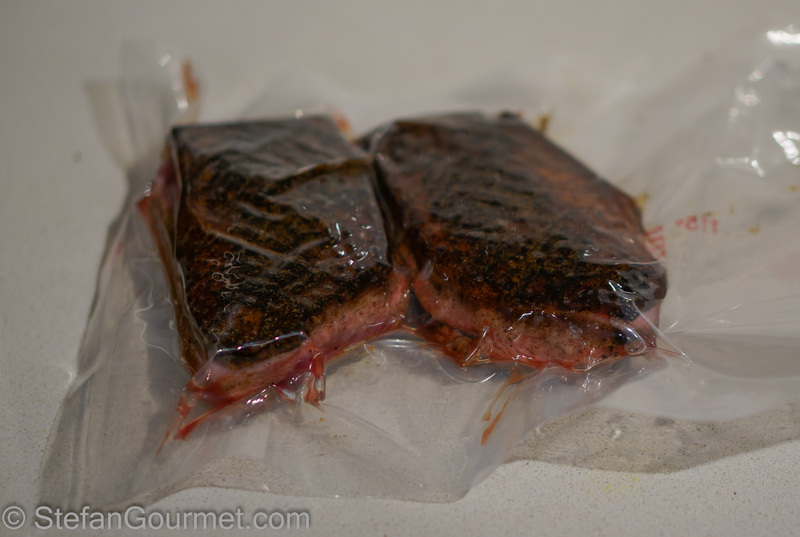 Cook sous-vide for 1 hour at 90ºC/195ºF. When cooking the duck sous-vide as well, vacuum seal once the duck is cold (when you try to vacuum seal the duck while it is still warm from rendering the fat, the combination of high temperature and low pressure will result in boiling the juices) and cook sous-vide for 2 hours at 57ºC/135ºF. 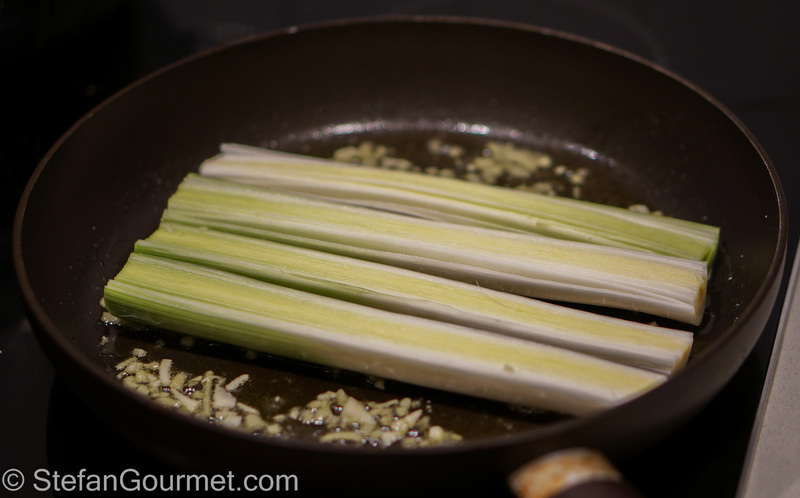 …and add the leeks. Season with salt. Cover and cook over medium low heat for 15-20 minutes. 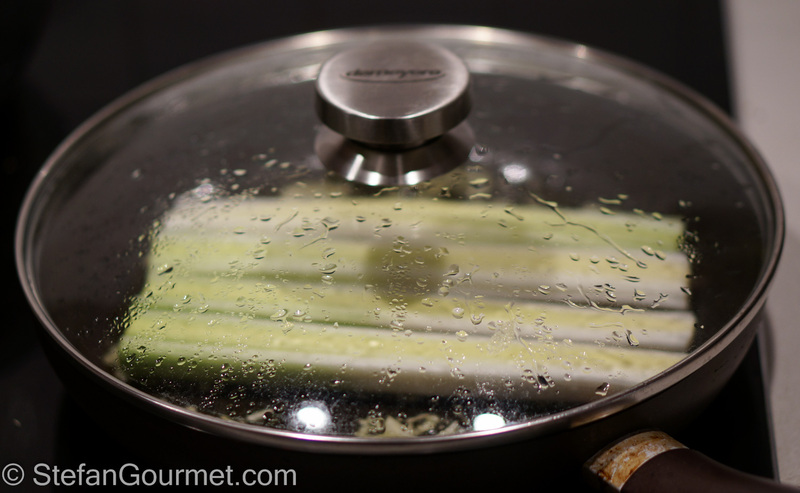 Gently turn over the leeks (so they won’t fall apart), season with salt, and cook over medium low heat for another 15-20 minutes. 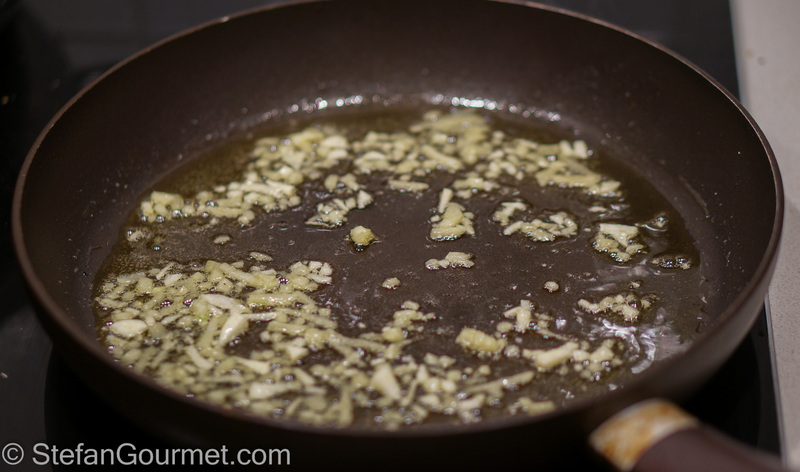 Once the salsify are cooked, briefly rinse them and reheat them with the remaining tablespoon of butter. 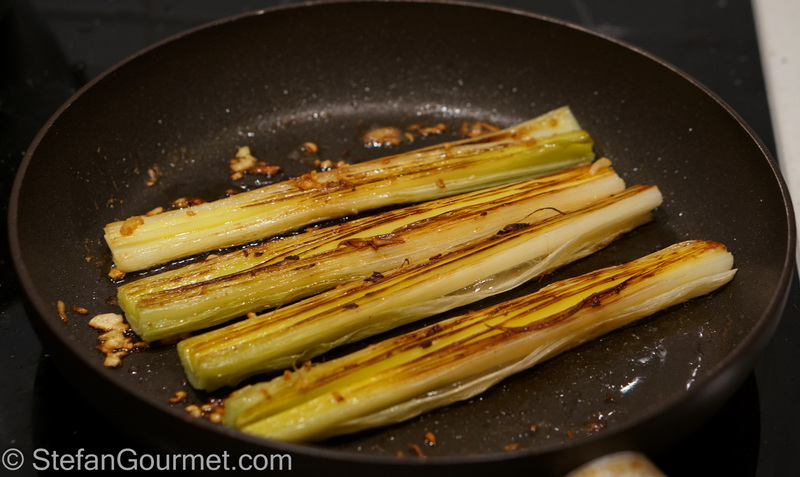 The leeks should be nicely caramelized on both sides by now. Slice the duck and season lightly with salt. 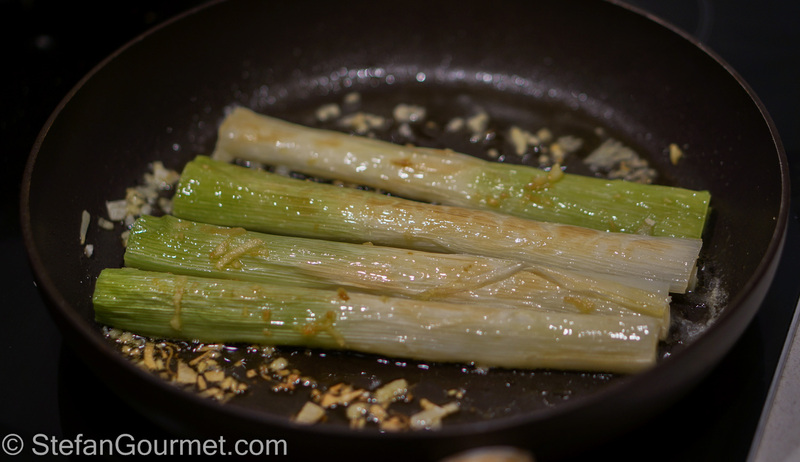 Arrange a leek on each preheated plate, with the salsify and duck slices arranged on top. Dust the salsify with the minced fermented beans. Serve at once. We enjoyed this with a pinot noir from New Zealand. Another ‘ripe’ type of pinot noir that is not too tannic would also work. For 26th December I often prepare Tournedos Rossini: beef tenderloin with foie gras, truffle, and madeira sauce. It is one of my favorite dishes and I still remember tasting it for the first time on June 17, 2003 at Auberge du Falkenstein in Philippsbourg (north-east of France). It was good there were hardly any other guests around, because the noises I was making while eating this might have caused other people to think we were doing something else rather than eating. It was THAT good. And then to think that the version at Falkenstein did not even have truffle. 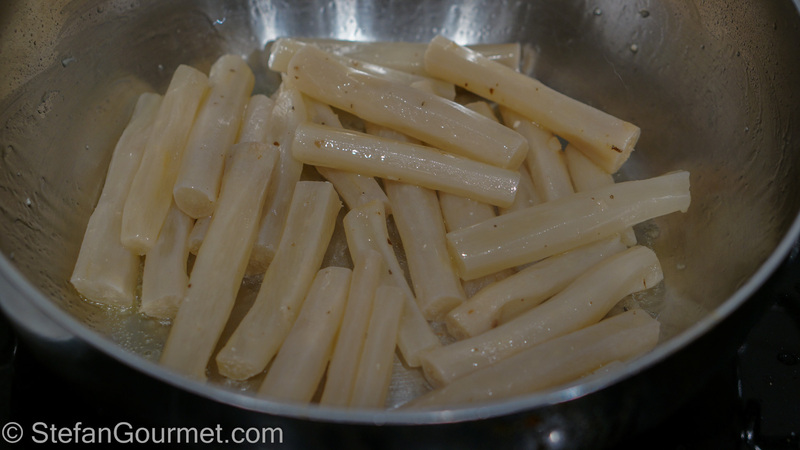 I’m dying to try salsify sometime… I’ve only seen it while traveling down south when it was impractical to buy any. Interesting use of fermented beans… did you soak them first at all? I didn’t soak the fermented beans at all, just minced them right from the bag. I don’t think I ever had salsify. If it tastes anything like burdock roots it is wonderful. A very delectable duck dish. Interesting recipe! I love salsify and have a recipe or two on the blog, but this is radically different from anything I’ve ever seen or cooked myself! Happy holidays! Very elegant Stefan. I have yet to try salsify. A treat in store by the looks of this post. If we are not talking, happy Christmas to you and Kees. Thanks, Conor. Happy Christmas to you and ‘the Wife’, too!